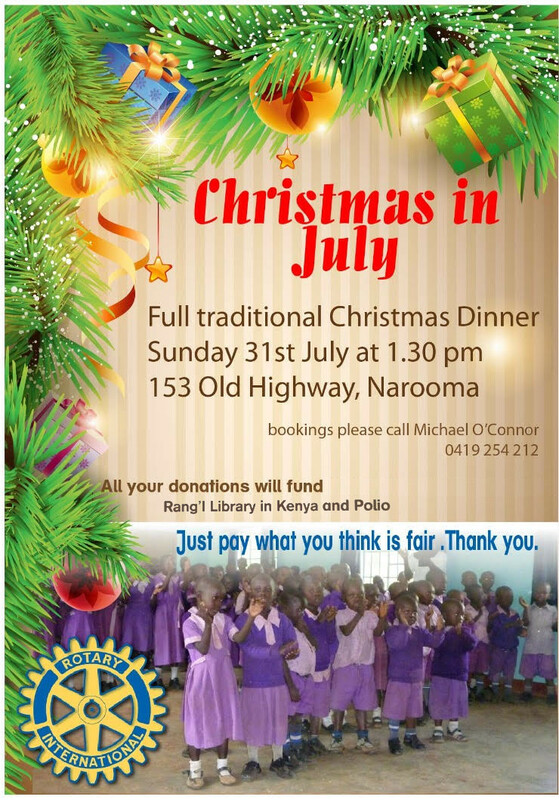 frank – Narooma Rotary Club Inc. If you are unable to do an allocated duty please arrange a swap and advise the Bulletin Editor. Movie Night – this Thursday! Don’t forget to ring Michael to book ! 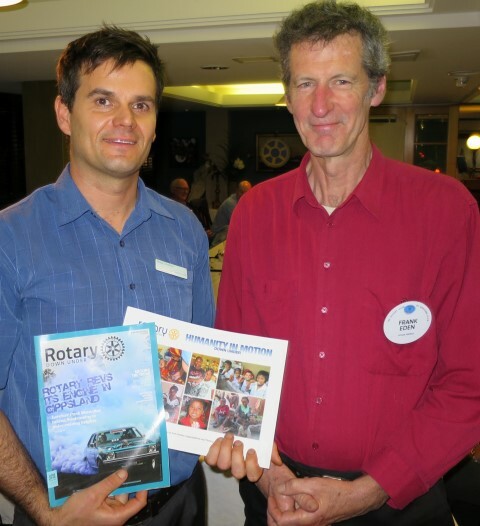 Last Thursday evening Mark Shorter from Eurobodalla Shire Council was our guest speaker. Mark looks after all manner of sustainable and renewable things for the Council. A lot of work behind the scenes has resulted in the Council saving not only money in operating costs but also reducing their carbon foot print. This is a fantastic win for the community and the environment. This is the exciting future our politicians keep on about but we rarely have the chance to see it in action. Well done to Mark and his team and to the council. Hopefully we’ll see the Council as a stallholder at our Renewable Expo in November. Saturday I drove Radar and three other exchange Students to Canberra for their final get-together. This was a chance for them to mingle, sign flags etc and for Youth Exchange magician John Briton to hand over certificates and say his good byes. John is the face of this very popular program and works very hard to make sure it all works …. an amazing effort. A quick thank you to Laurelle and Rod for bringing together our Change Over program at the end of this month. Mark Shorter is the Sustainability Coordinator for the Eurobodalla Shire Council (ESC). He started his talk last week with a very short history of the Council’s early attempts to do something about its carbon emissions. 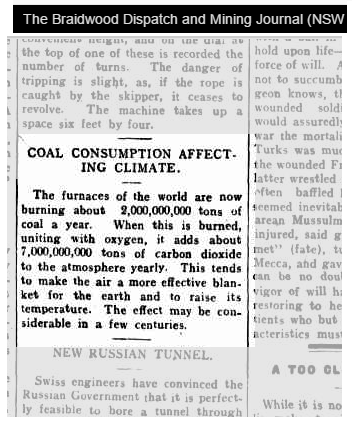 His first slide was interesting – a newspaper clipping from the Braidwood Dispatch in 1912, so we have known about the risks for a long time. The targets set by the ESC for 2012 were not met, and Council has since put into place a more effective strategy, starting with a close examination of each of the Councils activities and its impact. A very surprising outcome is the finding that waste is contributing 57% of the Councils emissions. The council tips and sewerage works release a lot of methane, which is of course a much more potent greenhouse gas than CO2. A grant has been received which will allow Council to capture that methane and either burn it or potentially use it to generate electricity in the same way they do in the Mugga Way tip in Canberra. The ESC has also embraced behind-the-meter solar to reduce its electricity bills. The admin building has 75kW. The largest site is 100kW at Deep Creek Dam – used for pumping. Altogether there are 26 sites comprising 637kW – 2,500 panels. Unfortunately, because the feed-in price is so low, there is no incentive to add solar capacity over and above what is needed to meet Council’s own usage. This situation will change when virtual net metering is introduced. The council is on track to reduce its emissions by 25% by 2020. Their efforts so far are very encouraging, especially because they save an estimated $244,000 pa.
Peter Bull pointed out that it would be interesting to see how this compares to other councils. Shanna Provost mentioned that she has recently completed a photo shoot to help promote composting. Watch out for workshops on how to do it effectively. Bob recommended listening to Professor Andrew Blakers from the ANU, speaking about renewables and a 100% target for Australia. (That link will expire on 8th June). Everyone was very impressed with the great strides Council is making in the area of energy security, due we are sure to Mark’s good efforts. Keep up the good work. The cost savings, and benefit to the environment are substantial. As promised in last weeks meeting, here is a link to the Goulburn Community Solar Farm Feasibility Study. And also Clearsky Solar. The SouthCoast Health and Sustainability Alliance (SHASA) is seeking expressions of interest from anyone who wants to benefit from a low cost quality solar system and reduce their energy bills. 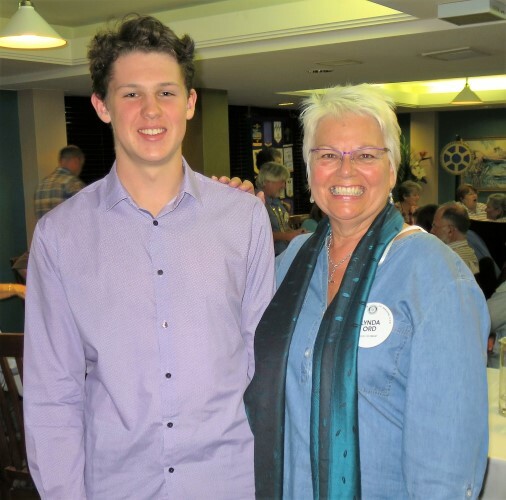 SHASA is a not-­for-profit community group based in Eurobodalla who help to make renewable energy more accessible and affordable. It is coordinating a solar bulk buy for the Eurobodalla community. Back from a stunning week off and tackling the emails and generally catching up. Last week Merinda and I went to Canberra Zoo where we stayed for two nights with a Cheetah, not in the same room but next to us. Everything about the time there was first class from the food, to the tours and the staff. Thank you to Laurelle for holding the fort during my absence. Saturday we were able to pick up Radar on his return from the super “Reef to Rock 2016” trip. He chatted happily all the way home – he had a wonderful time! Laurelle has been hard at work organising the Pride of Workmanship Awards which will happen this Thursday night. It is always a great night as we recognise hard working employees nominated by their employers. This Sunday is our ANZAC Markets. If you have already put your name down, thank you! If not and you can help, please do so asap. Please make sure you let Anthony know by Tuesday if you are not coming on Thursday night. Is is assumed that you will be attending and eating unless you advise otherwise. Your meal will be charged to you if notice is not received. Many thanks to Lynn for organising a new fridge for the van and a working bee this morning to install it. Thank you to Lynda, Ashley and John Doyle for your wonderful support and help today. The Ecuadorian government has today requested international assistance to help with the relief effort following the major earthquake that hit Ecuador on Sunday 17 April. A ShelterBox assessment team consisting of operations coordinator Jon Berg (UK) and response team volunteer Kara Lapso (US) will arrive in Ecuador on Wednesday 20 April. The assessment team is in contact with the government, other responding agencies and rotary, and has started the process of identifying the type and quantity of aid required. ShelterBox has aid prepositioned in Panama, Bolivia and Colombia and the wider team is currently looking into options for getting this into Ecuador as soon as we have a fuller understanding of what is needed. Information is now starting to come out of the most affected areas, which have been difficult to access due to extensive landslides. 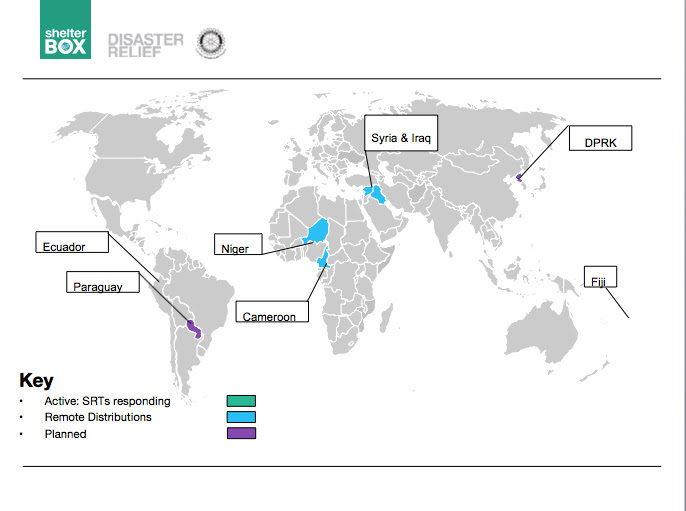 Aftershocks are continuing, and there have now been more than 130 since the initial earthquake. Gary Traynor spoke to us about the Kakoda Trail, a topic he is passionate about. He has done the walk many times, often leaving the path to look for artifacts. There is a lot of unexploded ordinance still left lying about – and still capable of causing harm. An engaging speaker, he reminded us of the close encounter our country had because of the threat from the Japanese at that time. The following is from Wikipedia . . The Kokoda Trail or Track is a single-file foot thoroughfare that runs 96 kilometres (60 mi) overland – 60 kilometres (37 mi) in a straight line – through the Owen Stanley Range in Papua New Guinea. The track was the location of the 1942 World War II battle between Japanese and Allied – primarily Australian – forces in what was then the Australian territory of Papua. The track runs from Owers Corner in Central Province, 50 kilometres (31 mi) east of Port Moresby, across rugged and isolated terrain which is only passable on foot, to the village of Kokoda in Oro Province. It reaches a height of 2,190 metres (7,185 ft) as it passes around the peak of Mount Bellamy. The track travels primarily through the land of the Mountain Koiari people. This week I received an email from Clubrunner proudly claiming 8,000 clubs as customers worldwide. As you will recall, our website was formerly managed by Clubrunner software, and cost us around $400 per year. We now use WordPress hosted with Ventraip and all up it costs approx $40 per year. And for many reasons, what we have now is a much better website than before. Some quick arithmetic – 8,000 times $400 is 3.2 million dollars – a darn lot of money in my opinion. Despite I have an IT background, I managed to steer clear of anything to do with websites in my career so I dont have any extra advantages over other mere mortals. But WordPress is just so easy it doesnt require much expertise! Often we don’t think beyond the walls of our clubrooms – but every club faces the same set of problems – and a website is just one of them. One wonders why website hosting is not a service provided at the district level? Using subdomains we could even avoid the cost of domain registration. Many thanks to Bob Aston, who had kept (electronic) copies of our old newsletters. I have made them all into PDFs, standardised the naming and loaded them up. So now we have all newsletters available from 2005. There is some interesting reading in that lot. And dont forget you can let Google find stuff in those old newsletters. Note the double quotes and the restriction of the search to just our website. But don’t try it straight away, as it can take a few days to weeks for google to index our site, and all the names of the newsletters have changed. Earlier newsletters will still need to be scanned, but fortunately, they will still be searchable. It just takes time to do. Narooma has our very own fungi expert, Teresa Van Der Heul. She led up an excursion into a couple of patches of rainforest this week, it was a fascinating look at the often extremely tiny world of fungi, and the very important part played by fungi and molds in the ecosystem. The tour is to be repeated on the 17th May, 10am – 3pm. I can highly recommend it. 12 – 1 Lunch Break at Quota Park, Riverside Drive, Narooma. BYO lunch or purchase something from the Boatshed Cafes. Take two informative walks through the different types of rainforest which exist at Narooma – the Wagonga Inlet Littoral Rainforest and the Box Cutting Rainforest with Botanist, Jackie Miles. Learn to identify the native rainforest plants and the threatening weeds. Land Services Officer, Peter Gow will be discussing a range of weed control techniques. Fungi specialist, Teresa Van Der Heul, will point out some amazing fungi which are present in these ecosystems. Book with Peter Gow on 4475 1001.